Will we see this handset in a few days time? Hands on images claiming to show off the Nokia Lumia 820 have appeared online, revealing a sleeker looking Lumia design. We reported last week that some leaked press shots of the Lumia 820 and Lumia 920 had appeared on Twitter – although the handset appearing in the Lumia 820 image differs slightly from these latest snaps. 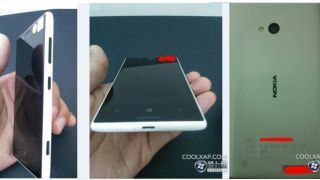 The new images, which popped up on Chinese site coolxap, show a white Nokia handset sporting a similar design to the Lumia 800 and 900, although the device seems to be slimmer than its Windows Phone 7.5 running predecessors. The Nokia Lumia 820, also known as the Arrow, apparently sports a 4.3-inch display and runs the upcoming Windows Phone 8 operating system, and according to the images it will pack a lowly 335MB of RAM. The snap which shows the back of the handset has wording which states "Property of Nokia, not for sale. Prototype" – so there is a chance this particular model may never see the light of day. All should become apparent later this week though, as Nokia is holding a special event in New York where the Finnish firm could unveil its first Windows Phone 8 handsets. TechRadar will be present at the event to keep you up to date with all the latest from the Nokia camp.